UPDATE 1: District 5 Councilor Tim McCarthy has just informed us that he will be unavailable for the October 3rd forum because he will be testifying on that day before congressional hearings about the airplane noise issue in Washington, DC. We wish Tim luck in DC fighting for us on this important neighborhood concern. We are accordingly going to reschedule that panel for a date TBD later in October. UPDATE 2: At-Large City Council candidate William King has let us know that he will be able to participate in the forum. This is great news and we look forward to an informative evening on October 3rd. UPDATE 3: We will use the time from 6:30 to 7:15 pm to have an open forum discussion coordinated by WalkUP Roslindale, so please feel free to come early and help us identify and move forward on the issues that matter to you. As we’ve previously announced, the forum will address the issues we focus on — active mobility and new housing and commercial development in our neighborhood. We see these issues as inextricably linked and mutually reinforcing. Hope to see you at the forum! If you’re interested in attending, please let us know on our facebook page event entry. Thanks!!! 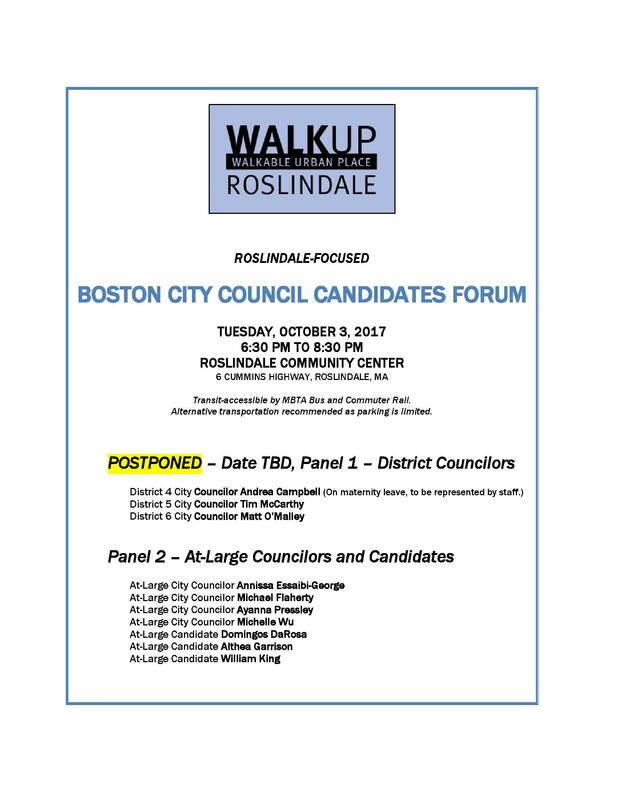 WalkUP Roslindale is pleased to announce our Roslindale-focused City Council Candidates Forum, to be held on Tuesday, October 3, 2017, at 6:30 pm at the Roslindale Community Center (corner of Washington Street and Cummins Highway). The forum will address the issues we focus on — active mobility and new housing and commercial development in our neighborhood. The 3 district councilors who represent our neighborhood – Councilors Andrea Campbell (District 4), Tim McCarthy (District 5), and Matt O’Malley (District 6) – have all been invited. Councilor McCarthy has committed to participate, Councilor Campbell is TBD (she returns from maternity leave at the end of September and her schedule is unsettled), and we are waiting to hear from Councilor O’Malley. We have also invited all of the incumbent At-Large Councilors – Councilors Annissa Essaibi-George, Michael Flaherty, Ayanna Pressley, and Michelle Wu – and the 4 challengers – Domingos DaRosa, Althea Garrison, William King, and Pat Payaso. Thus far, we have commitments from Councilors Essaibi-George, Pressley, and Wu, and candidates DaRosa and Garrison. We will provide updates as we get closer to the event. We encourage everyone who is interested to attend! Thanks!